The Nelsons Pure & Clear range is a homeopathic and holistic approach to acne treatment with the inclusion of the Acne Treatment Tablets. Homeopathy is a gentle alternative, providing symptomatic relief for many skin conditions. 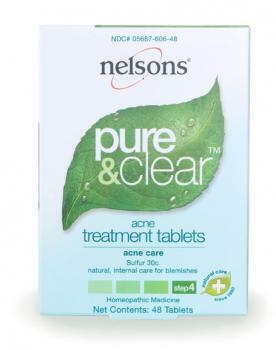 Nelsons Pure & Clear products have the added internal acne care benefit of the Sulfur 30c tablet format, known amongst homeopaths for its many skin benefits. Sulfur is highly regarded around the globe to treat many skin complaints from acne to eczema. How to use: Take two tablets every hour for the first six doses, then three times daily between meals until acne and blemishes subside. Inactive Ingredients: Lactose, Sucrose Did you know 1 in 5 adults bought homeopathic or herbal remedies over the counter in the last 12 months. For the relief of acne, pimples, and blemishes.